Dear Readers are you seeking for the latest government job in Bihar Public Service Commission then you are at the correct place because here, in this article, we mentioned each & every detailed information regarding the Bihar PSC 63rd CCE Vacancy 2018 in the below discussion of the article. This is a golden chance for all those participants who want to make their career bright in Bihar Public Service Commission job then they must read this given article very attentively & get all the latest updates regarding the BPSC Notification 2018 from here. You may apply for this recruitment from the official website of Bihar Public Service Commission which is www.onlinebpsc.bihar.gov.in. Moreover, the information you can bookmark our careerjobs360 official webpage & stay in touch with us for further use. Bihar Public Service Commission has depicted an employment notification for BPSC CCE Vacancy 2018 for well deserving and passionate candidates for 355 Posts in the department. Candidates who are looking for the job in Bihar Public Service Commission then they don’t miss this opportunity and may apply for this Bihar PSC 63rd CCE Recruitment 2018 from the official website of BPSC. All the eligible and skilled candidates may fill the online application form on or before the deadline date which is 06th November 2018. All the relevant Information of BPSC Jobs 2018 such as eligibility criterion, salary scale, application form fee, key dates, how to apply application form, and other important information are available below in the article. The aspirants must satisfy all the criteria to apply for the BPSC 63rd CCE Vacancy 2018. The contestants who want to apply for the BPSC Jobs 2018 should know the eligibility criteria before applying for the recruitment. The aspirants must read the below-provided information. For SC/ ST(Male/ Female) Category: 42 years. For UR(Female) & OBC(Male, Female) Category: 40 years. Age Relaxation: The relaxation in age will be given only to reserved category applicants as per the rules and regulations of the government. Selection Process: The applicants will be selected on the basis of their performance in the following rounds which is going to be conducted by Bihar Public Service Commission. Interested and skilled participants who are willing to apply online for this Bihar PSC 63rd CCE Recruitment 2018 they must read the full eligibility criteria from the official notification before applying for the post. Then, candidates can fill the online application form and submit it on or before the last date that is 06th November 2018. All the participants can follow all the given guidelines which are given in the below article and apply for the post easily. 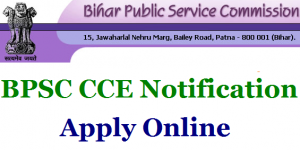 Then, go through the career section on the homepage and find out the Bihar 63rd CCE Recruitment 2018 Notification Link. After that, click on the official notification link and open it on the next web page. Now, read all the instruction very carefully which is given in the official advertisement. After that, fill all the correct details on the Application Form. Attach all the required credentials for the application form. Upload recent passport size photograph and signature on the application form. Deposit the application form fee if required. Here, we provide the each and every detail about the Bihar 63rd CCE Recruitment 2018 in the above article. All the interested and eligible applicants may apply for this vacancy from the official website of the department. If any of the candidates face any kind of problem then they can comment on the below comment box then we will help you as soon as possible. For more detailed information, candidates can check our official website and get all the latest update from here and stay connected with us for further reference.